Sales funnels are all about the buying journey your customer takes; from becoming aware of your brand and products, to signing the order form. The problem is that this marketing model was developed in 1898 (by American advertising expert Elias St. Elmo Lewis) and an awful lot has changed since then. With that in mind, ask yourself this, just how well aligned is my content to my sales funnel? Awareness: Your customer knows about a product or service. Interest: Your customer is actively interested in a product group. Desire: Your customer wants a specific brand or product. Action: Your customer makes a purchase. 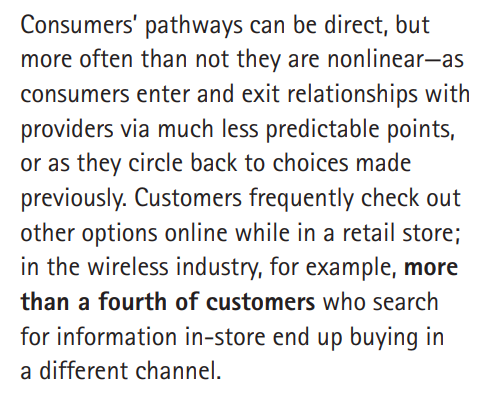 The problem with each of these models is that their sales funnels are linear, with a beginning middle, and end. While this isn’t an unrealistic model, it’s not one your business should buy into dogmatically. Why? Because when your customer ends their journey they’re gone. Thinking solely linear is so 1898. Today’s powerhouse businesses know that, to be successful, their customer buying cycle has to keep spinning, with the wheel turned each time their customers make a purchase. In order to keep this wheel spinning you need to be aware of the continuous engagement model when reviewing the content in your sales funnel. Discover: Your customer finds out about a product or service. Consider: Your customer reviews the different product or service groups. Evaluate: Your customer makes a decision on which brand to select. Purchase: Your customer buys your product. Use: Your customer tests out your product. Promise: You make a commitment to how your product will perform. Consider: Your customer will consider buying from you again and the cycle restarts from this point. Your customer can join the buying cycle at various stages, seek information from different sources, and may adopt a staccato approach to their buying decisions – they might get to the penultimate stage of the buying cycle, abandon their purchase, then come back and buy it at a later date, from a different sales channel. This changes how you need to create and disseminate the content you use in your sales funnel; for your sales funnel to be realistic, you need a smart content marketing funnel to function in an omnichannel world. Lewis’ model might be outdated, but adopting the continuous engagement model full-scale makes it difficult and expensive to quantify conversion rates throughout your funnel. The realistic and smart way for you to design the content driving your sales funnel is to incorporate both. What does this hybrid look like? 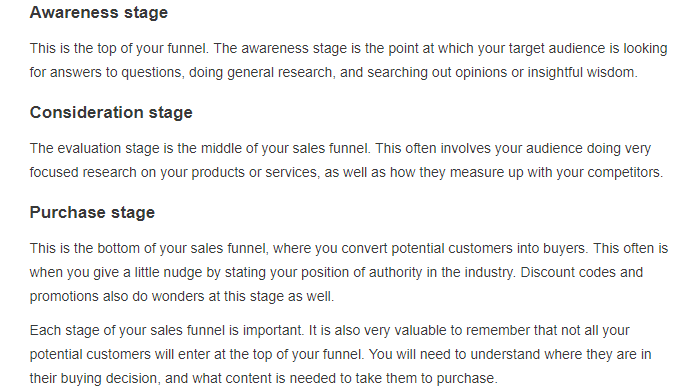 In order for your business to have a realistic sales funnel you need a three segment approach, and there are specific types of content you need at each stage. At this stage your customer is becoming aware of a problem which they need to resolve. Your goal is to hone in on your audience’s pain points and increase their awareness of the need to find a solution to them. You must consider how well your brand is set up to disseminate the content that you require in order to have a realistic sales funnel. As social media is a huge part of TOFU, your brand’s website must work in harmony with your social media channels. Conduct research into your target audience and establish what their preferred social media channels are and then align this with the platforms your business uses. You also need to think about social media automation tools. This is crucial because you need to reach your audience at the right time and also use the time that you have at your disposal wisely. The midpoint of your funnel is about making your customers buy into your brand and your vision of problem resolution. Your goal is to put the building blocks in place to establish a long-term relationship with your customers. It’s at this stage that you can collect your customers’ email addresses. The value of doing this is that you can re-target your converted customers and return to those who have begun but failed to complete the buying process. Your website must be built using a CMS that’s compatible with email marketing software in order to do this, but the value to your business of doing this is enormous – email marketing returns an average of $38 for every $1 that you spend. Your goal here is simple: convert your audience into customers, ones who will buy your products now and ones who will come back to your business again and again. Sales funnels have been a feature of business for over 100 years. They are a hugely valuable way of maximizing the buying journey you take your audience on, so that you can convert them from users looking to resolve a problem to long-term customers for your brand. In order to turn your audience into customers, you need to have content supporting your sales funnel in a way that’s realistic. So, when you review your sales content sales, remember that TOFU isn’t just for eating. Victoria Greene is a branding consultant and freelance writer. On her blog, VictoriaEcommerce, she shares tips on how brands can use the power of content to drive up revenue for their business. Visit www.docsend.com to learn more.